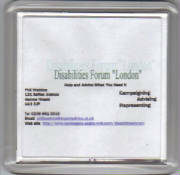 Disabilities Forum are unfunded so we get some funds from our sales items. 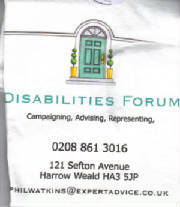 All items from Disabilities Forum address on home page, cheque payable to "Phil Watkins" e.mail first to confirm stock. 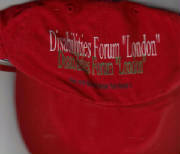 Items sent within 24 hours of cheque reciept. If ordering more than one item only pay highest items postage.